The Adventures of an Intrepid Reader: What's on Your Nightstand? I saw this over at Page After Page and thought that a once a month post like this might be fun! 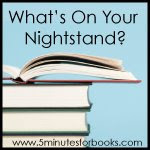 So the question being asked over at 5 Minutes for Book is What's on Your Nightstand? The only danger with posting this is that you will see that some books seem to languish there and never move and other's come and go quickly. I do tend to read a lot more romance at night as well, so I would expect to see more of them on the nightstand than other types of books. I should mention that this is not the books that I would expect to be reading over the next month as those books are in a separate bookcase. So what is there now? How about you? What do you have on your nightstand? OH! I have been tempted pick up Luncheon at the Boating Party but just haven't. I hope you review it as I would like to hear how you liked it--or not. It is fun cruising the blog world and getting a peek at all these piles of books! Susan Vreeland is a name from my reading past but for the life of me I can't think why. It must have been something I enjoyed to have stayed with me so strongly. I must add this on to that mountain I call the tbr pile! Other books by Susan Vreeland include Girl in Hyacinth Blue which I have read and really enjoyed, and Passion of Artimesia and The Forest Lover which I haven't read yet. This one is good so far. So glad you joined us! It is a little bit of accountability, but mostly just a chance to share.